TECH PACK TECHNOLOGY: Mass Multiplication Medium Of Biofungicide Trichoderma spp. Biological suppression of plant pathogenic fungi has been dominated by use of Trichoderma spp all over the world for last 2-3 decades. 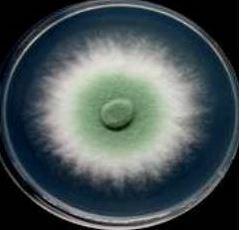 Trichoderma spp. act as a biofungicide against many plant pathogenic fungi and have been found to induce systemic resistance in plants. The field applications of Trichoderma spp. require mass multiplication which can be done using solid as well as liquid state fermentation. In the industrialized nations, liquid fermentation is extensively used for multiplication of Trichoderma spp. for commercial formulation. However, solid state fermentation is preferred in developing countries like India due to low initial investment as well as availability of cheap labour and space. Presently, solid state fermentation technology uses food grains including sorghum and bajra for commercial mass multiplication of Trichoderma spp at an industrial scale. However, the food grains are comparatively expensive, have short storage life and may not be available freely due to climatic stress. Thus there is an urgent need to develop a formulation based on easily available material and with lower input cost. We have developed a low cost mass multiplication medium for faster growth of Trichoderma spp. This material supports better growth of biofungicide compared to existing methods and addition of synthetic sticker is not required while making its formulation. Another advantage is that this material can be used for both solid as well as liquid fermentation. This material provides longer shelf life of the biofungicides and also improves the resistance of the plant against diseases. The process is cheaper than the existing methods and is based on the material which is inexpensive and available locally. This technology will thus be a boon to the biopestcides industry based on Trichoderma spp. This material is low in cost. It supports faster growth of Trichoderma spp and helps in longer shelf life of the fungus. There is no need of additional synthetic agent like Triton-X100 or carboxy methyl cellulose while making its formulation for field applications. This material increases the resistance of plant against diseases and has antibiotic properties in addition. This could be used by most of the companies manufacturing biopesticides. Organic manure manufacturers can also use this technology. Raw Materials Requirement : All the raw materials used for the mass multiplication of the Trichoderma spp. are available locally and the materials required for making its formulation are available within the country and are available in local market. Infrastructure Requirement : Preparation of the Trichoderma spp. requires small setup of the laboratory with autoclave, laminar air flow and routine material required in microbiology laboratory are sufficient for this technology setup. Manpower Requirement : One Microbiologist and 1-2 skilled workers would be adequate for the purpose which can vary depending upon capacity of the unit.